Alan's Roofing & Construction Inc.
A Roofing Job Completed by A GAF Master Elite Roofing Company. The customer tried to stop the roof leak with a plastic bag. Notice the valley shingles were not installed according to manufacturers specifications. Warrantees are often "Void" after faulty workmanship. This customer refused to have the original contractor back for repairs. It is in your best interest to be introduced to the worker who is actually performing the work. This is where the consumer has the opportunity to question the qualifications of the installer Personally, Versus taking the word of a Salesman. PLEASE READ BELOW & BECOME A SMART CONSUMER !!! We Have Noticed An Increase In The Venice Area; Unlicensed & Uninsured Roofers Portraying as Legitimate Contractors. Ask For A Copy Of License & Insurance, Verify Employment If He Says He Works For That Said Company ! As a consumer it is your responsibility to hire the correctly license contractor to perform your work. Professional Regulations to request the Circuit Court to impose a civil penalty no less than $500 and no more than $5,000 for each offense who knowingly hire unlicensed contractors. ROOF REPAIRS; Some Contractors will charge less & do less work needed to stop a Roof leak. Let's assume you hire a contractor that says he knows where the leak is & Guarantees his repair work. After a few heavy rains it leaks in the same spot on your ceiling. You call him up and he says "It's not leaking from the area he patched, it must be coming in somewhere else". Now the Consumer has additional repairs & costs to fix the original problem. 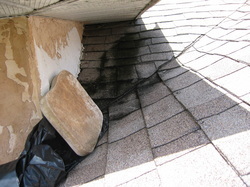 A Smart Consumer will request a Guarantee in writing that the Roof leak that has stained the ceiling will be repaired. As a consumer it is important to choose the correct contractor for your specific needs. Some Roofing Contractors do all types of Roofing without the knowledge, experience or qualified workers to perform the task. Unfortunately workers come and go, therefore the referrals that were supplied may not be with the same workers on your project. Surely they will not tell you this fact. Some Roofing companies have an "Elite" status with material manufacturers and supplying an unrealistic warrantee. This status is supplied to the company and not to the employees / Installers with little or no experience. Most material manufacturers rarely check the work of the contractors. Some warrantees have hidden exclusions and criteria that can not possibly be performed therefore voiding your warrantee.The majority of our repair work is due to improper installation in crucial detailed areas. The ability to diagnose the problem and repair it correctly takes many years of "hands on" experience. Please consider The Honesty of Alan's Roofing (Owner, Operator ) with over 40 years experience in any of your roofing related issues.